The arcade monitor is the option which generates the most original arcade feeling. But an arcademonitor is the most expensive option and is not as easy to connect to the computer as a pc monitor. A TV is the cheapest option, but the picture quality is low and can't be used for anything else than arcade games. So i selected the last option, a used 21" pc monitor which is cheap and easy to connect to every graphic card. After doing a quick search i found a used 21" Fujitsu-Siemens for 30,00 EUR on ebay. The picture looks a bit blocky with old, low resolution arcade games, but that problem can be solved with the correct settings in Advancemame. 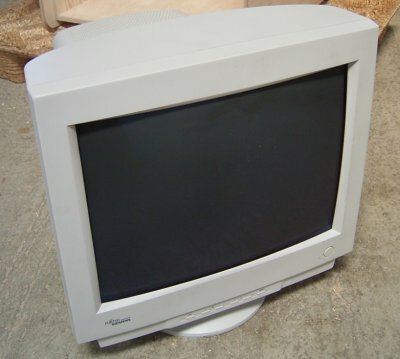 The picture below shows the monitor as it arrived. The case looks like new, and the picture is cristal clear. First, i tried to remove the plastic case from the monitor, but the metal cage which protects the electronics is so weak, that is's impossible to handle it whitout damage. So i put the plastic cover back to its place. 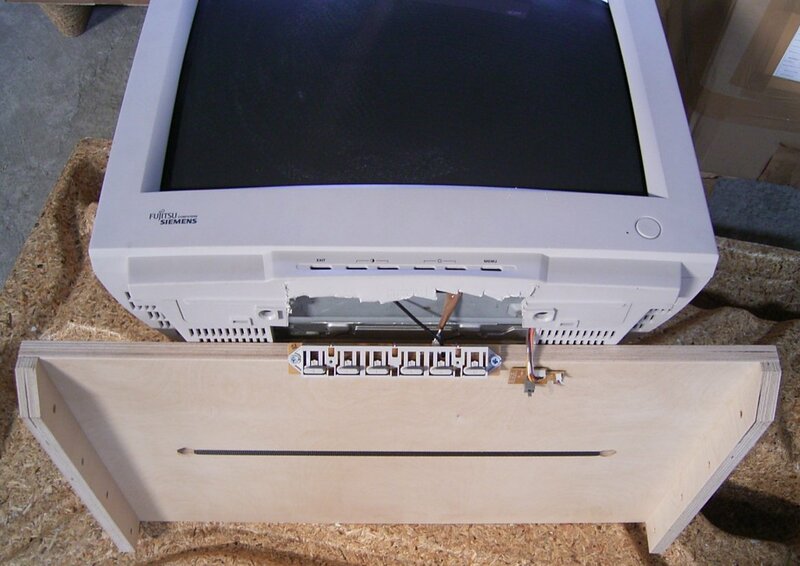 First, i removed the base and tried to put the monitor to its place. The big 21" monitor looks a bit lost behind the cover of glass. Maybe i have to change it to a bigger one later. But for now its enough. 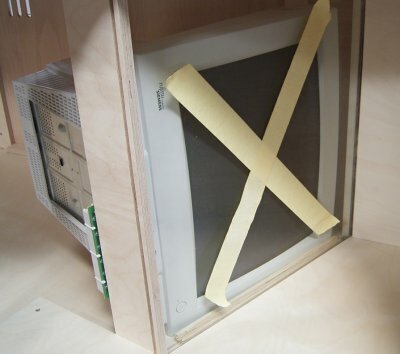 Since the monitor is placed behind the cover of glass, the controls placed on the frontside are unreachable. Unfortunately the front part of the plastic cover cannot be removed easily. I would have to take apart the complete metal cage in the inside, which would provoke bigger damage. So i just remove the piece of plastic that covers the control buttons. I have luck and all cables are long enough to relocate the controls and power switch to the outside. Only the power light has a cable which is to short. The picture below shows the controls mounted to the on the monitor support where they are easy to access when the controlpanel is removed.